HMAS Warramunga sails past the Cocos (Keeling) Islands in November 2017. The future of U.S. Naval Support Facility Diego Garcia (NSFDG, also known as Camp Justice) is increasingly uncertain. NSFDG is strategically vital for U.S. power projection and anti-access/area denial in the Indian Ocean. The base supports bombers (including B-1s, B-2s, and B-52s) operating in the Indian Ocean and Persian Gulf regions, facilitates the U.S. military’s sensitive regional communications network, and provides fuel storage for air and naval units. NSFDG’s location on an isolated atoll also makes it less susceptible to terrorist attack and discord among a local population, meaning power projection is less provocative and less visible compared to a theoretical base in an Indian Ocean country. Relinquishing NSFDG would catastrophically impact the United States and its allies’ ability to pursue shared national interests in the Indian Ocean and Persian Gulf region. The UN’s International Court of Justice (ICJ) may just bring this to bear. The court issued an advisory opinion in February that Britain’s occupation of the Chagos Archipelago, including Diego Garcia, was illegal since it separated the territory from Mauritius in 1965. By 1973 the local population of Chagossians had been forcibly relocated by the United Kingdom and United States to establish a U.S. military base — NSFDG — which has been in operation ever since. The atoll was originally leased by the United States from Britain for 50 years (1966 – 2016), but the lease was extended by another 20 years until 2036.
International pressure is mounting on the United States to close NFSDG, return sovereignty to Mauritius, and allow the Chagossians to return. 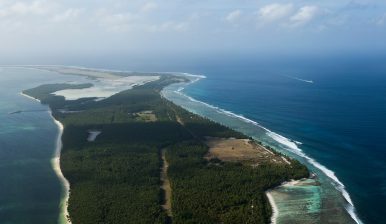 U.S. military retention of Diego Garcia is becoming increasingly untenable and a major public relations issue, with the ICJ opinion now set to be debated in the UN General Assembly. Should the United States make the Diego Garcia issue proof of their support for the international rules-based order and close NSFDG, strategic ramifications will be felt throughout the Indo-Pacific security community. Amid this uncertainty, it is understandable that U.S. defense planners would look at alternate locations in the Indian Ocean to house assets, and many may be looking at Australia’s Cocos (Keeling) Islands. The United States has been using the Cocos airstrip for several decades as a stopover point between Diego Garcia and Guam in the Pacific, as well as a partial alternative to Singapore’s Paya Lebar Air Base. While Cocos does have an airstrip, several factors will severely limit any expansion of U.S. military activity on the island. Cocos forms part of Australia’s Indian Ocean Territories, and is located 2,700 kilometers to the east of Diego Garcia in the Indian Ocean. Cocos is comparatively small (14 square kilometers) and is home to around 600 residents. While Cocos does have a 2,441 meter paved runway, substantial port facilities are lacking and the inner lagoon is less navigable by large vessels. Any new military infrastructure would have substantial environmental impacts on the fragile ecosystem and disrupt local populations. In addition to practical considerations regarding an increased U.S. presence in Cocos, Australia must debate and limit Cocos’ role in controversial military programs, such as U.S. extraordinary renditions. In 2008 CIA Director Mike Hayden confirmed that Diego Garcia was used for rendition operations – including transferring one detainee to Guantanamo Bay. Should the United States be permitted expanded access to the Cocos airstrip, limits must be set on the nature of operations being conducted on Australian sovereign soil. Further, Australia’s key partner Indonesia has previously expressed apprehension regarding U.S. Marines stationed close to Indonesia in Darwin, and may find expanded U.S. use of Cocos unsettling. While Australian policymakers understand the strategic importance of Cocos, especially to the United States, views are changing as Indo-Pacific maritime security dynamics evolve. In 2012, when pressed on U.S. military intentions to increase usage of Cocos, Australia’s then-Defense Minister Steven Smith stated that a deal with the United States is “very much down the track. It is not one of our three current orders of priority” and would not comment on a timeline. Since then, in response to a changing security environment, Australia’s Defense White Paper in 2016 committed to lengthening the Cocos airstrip to support larger and heavier aircraft (including the P-8A Poseidon maritime surveillance and response platform). Australian strategic thinkers are increasingly seeing Cocos as a valuable offshore Indian Ocean outpost, which should be invested in and shared by like-minded Indo-Pacific partners, to contribute to Indian Ocean security. Usage could include joint intelligence, surveillance and reconnaissance activities, including operating U.S. and Australian Triton surveillance unmanned aerial vehicles from Cocos. Diego Garcia’s uncertain future may be a catalyst for increased military collaboration on Cocos, within clearly defined and accepted parameters. Diego Garcia’s uncertain future will inevitably bring U.S. defense planners to Cocos, but they will need to know exactly what they are looking for. Cocos, based on its very different geography, political landscape, and population makeup, can provide only a very specific set of replacements. While Cocos cannot and should not entirely replace NSFDG functionally, limited areas of collaboration exist that could contribute to maintaining the rules-based order in the Indian Ocean, advancing both the U.S. and Australian national interests. Samuel Bashfield is a postgraduate student at the Australian National University, undertaking a Master’s of National Security Policy.